Remote, rugged, immense, our rohe straddles the North Island’s mountainous backbone. So remote are some areas they are rarely visited by humans. For centuries Te Urewera has been our homelands, our papakāinga, spaces occupied by Tūhoe ancestors. 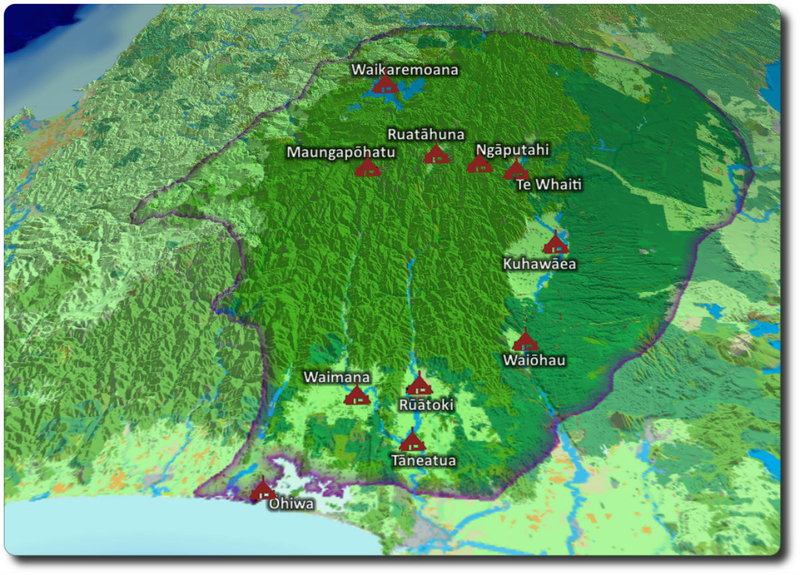 The communities of Waikaremoana, Ruatāhuna, Rūātoki and Waimana are the four corners of Te Urewera and are the mainstays of our presence. Over time the Iwi influence has extended it's rohe to include Te Putere in the south, from Kainaroa in the west to Ngātapa in the east. The northern communities of Tuhoe and other iwi used the resources of Ōhiwa Harbour. For Tuhoe, Te Urewera personifies Te Manawa o te Ika, the heart of the great fish of Māui. The phrase first coined by Murakareke the son of Tūhoe, and remains popular today with its regular use. For Tūhoe, Te Urewera is their ewe whenua, their place of origin and return, indeed their tūrangawaewae. Te Urewera holds a special place in the hearts of Tūhoe. Te Urewera expresses and gives meaning to Tūhoe culture, language, customs and identity. There they hold mana by ahikāroa, they are tangata whenua and kaitiaki of Te Urewera.Te Urewera provides food, clothing, medicine and shelter, it is the land we are birthed from and return to in death. Te Urewera is prized by other Iwi and hapū who have acknowledged special associations with, and customary interests in, parts of Te Urewera. Te Urewera is also prized by all New Zealanders as a place of outstanding national value and intrinsic worth. Tūhoe welcome public access to Te Urewera both as a place for public use and enjoyment.